This guest post is cross-posted from 350.org and written by Anna Keenan detailing our recent experience in Nepal. 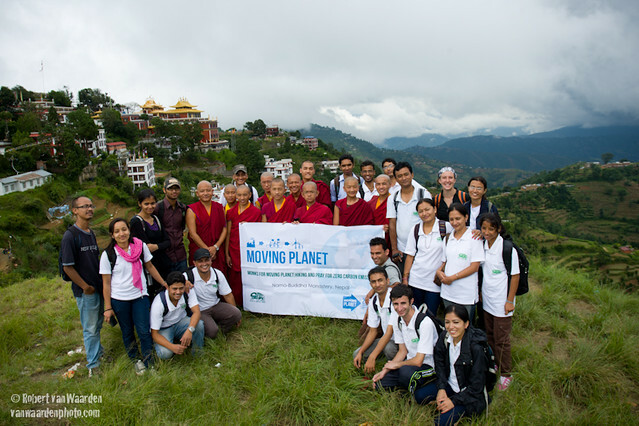 I spend most of my time working as a climate campaigner for Greenpeace International in Amsterdam, however for the 2011 global day of climate action – Moving our Planet beyond fossil fuels – I have somehow ended up in Kathmandu, Nepal, with climate-activist photographer Robert van Waarden. I simply couldn’t resist the opportunity to write about what “Moving Planet” has been like in this magical (and slightly crazy) city of contrasts! Today, there was not just one, but three major events in the Kathmandu area. First – we were up at 5am to make it on the bus to Dulikhel with Small Earth Nepal, a wonderful organization who are working on many aspects of sustainability – from awareness-raising, to scientific methodological training, to promoting biogas in rural villages. Today, 100 people hiked from Dhulikhel to Namo-buddha Monastery – where over 350 young monks are living and learning Tibetan Buddhist philosophy. The monks led our group in a meditation on a Zero-Carbon Future. Aside from philosophical leadership, these monks are also into practical action. One of the many interesting initiatives at the monastery is the on-site production of heating briquettes from the monastery’s paper waste and agricultural waste. These carbon-neutral briquettes are burnt in place of firewood (which is in short supply) to keep the monastery buildings warm in winter – and because the briquettes burn without smoke, they also improve air quality. 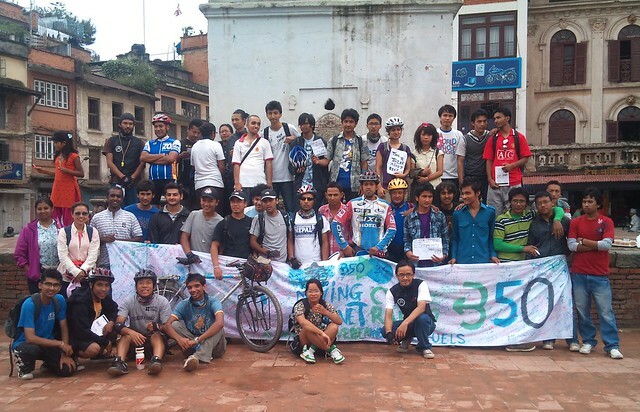 The second event – Nepalese Youth for Climate Action, along with Kathmandu Cycle City 2020, organised a cycle rally with over 120 keen young cyclists participated! In Kathmandu, every intersection is a chaotic, noisy blur of pedestrians, motorcycles, rickshaws, bicycles, taxis, trucks, as well as chickens, dogs and cows, all competing for space. The diesel fumes choke the city and many residents suffer from allergies or skin reactions. Cycling is not only good for the global climate – it could be a great solution to the local air-quality problem, and with no fuel costs, it is affordable – a big concern for most residents! However, the traffic chaos makes cycling a dangerous choice for anyone trying to ‘do the right thing’. Today’s cycle rally promotes the goal of Kathmandu being cycle-friendly within the decade – these young people are campaigning for cycle lanes so that more people can choose to cycle, in safety. 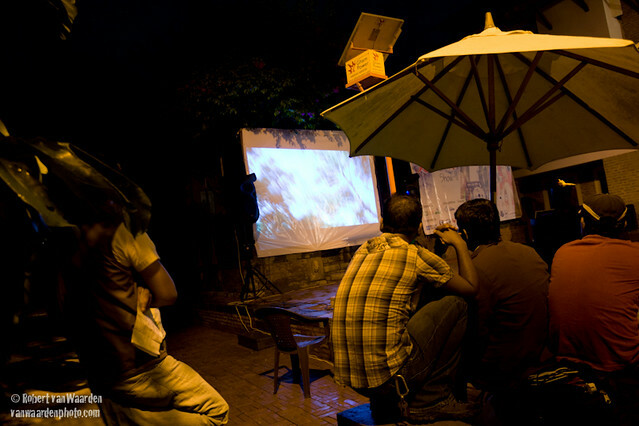 The third event was a fully solar-powered screening of short eco-films from around Nepal, run by Story Cycle. The solar panels charged the batteries during the day, and when the sun set on Patan’s Durbar Square, that renewable energy powered (despite rainy conditions!) a screening of 15 short films, made by young people, about local eco-issues in Nepal and South Asia. These three events are just the tip of the iceberg (or should I say instead ‘just the edge of a great Himalyan glacier’?) of the Nepali sustainability initiatives that we have had the pleasure of learning about over the last few weeks. With so many different types of climate action happening in one place, and so many inspiring, intelligent young people on the case, a sustainable future for Nepal is looking more likely every moment.